It is official - Danny Coughlan is a cry baby. Sorry, he IS Crybaby and he's got some lovely songs in his head and on the jukebox in his mind. The Sunday Times has already acclaimed the man's debut-album, simply titled 'Cry Baby', as 'truly wonderful', although that description probably went through Coughlan's mind after hooking up with one of childhood heroes for the production of the sessions and the finished article. The singer-songwriter was a mad Adam Ant fan who once wrote to the late Jimmy Saville's dreams-come-true TV showcase, Jim'll Fix It, in order to appear with his idols. Sadly, he didn't but time has made up for it - Chris Hughes, aka Merrick, has guided Coughlan through some exquisite songs AND banged drums throughout. Result. 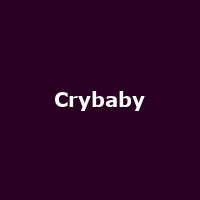 And what a result - The Sunday Times were right in their synopsis, 'Cry Baby' the album sounds a little bit special. His admiration for Roy Orbison and Elvis Presley is prevalent but there's a warm, spangly, contemporary ring to the ten tunes, much like Cherry Ghost, Richard Hawley and Camera Obscura if they had a male vocalist. If this is what being born in Croydon does to you, I might just move back and start a family. With such a delightful album under his belt, tickets for his shows should be in considerable demand. September will put this to the test when he will embark on a full-scale trip around the UK, starting with Edinburgh on 15th September, followed by Glasgow, Leeds, Manchester, London and many more until Bristol on the 27th. We have tickets to these shows on sale now, priced from £7 to £12.